Although deaths in children under 5 years of age have decreased by 50%, i.e., 12.7 million in 1990, still 5.9 million died in 2015 mostly because of preventable causes, and undernutrition is the underlying cause in 45% of these deaths globally. According to UNICEF estimates, 26% or 165 million children were stunted globally in 2011, and three-quarters of this burden was distributed in South Asia and sub-Saharan Africa. Despite economic development worldwide over the past few decades, tackling undernutrition still remains a challenge for low- and middle-income countries (LMICs). According to the recent Pakistan Demographic and Health Survey, 45%, 11%, and 30% of children <5 years of age were stunted, wasted, and undernourished, respectively. The survey also found that among infants 6–9 months, only 5.3% were exclusively breastfed, 10.3% received breast milk along with water, 11% received breast milk with cow's milk, and only 56.6% received CF in addition to breast milk. Pakistan approved a national infant and young child feeding practices (IYCF) strategy in 2008 to guide care providers and communities to ensure that children are breastfed and given CF according to the WHO recommendations. As rural Pakistan is more impoverished with respect to child feeding, 20% of children in urban and only 12% in rural areas are fed according to the IYCF strategy which recommends that children between 6 and 23 months need to be given frequently and increasing amounts of a variety of foods. Nutrition-related research in Pakistan and other LMICs has historically focused on improving breastfeeding practices only, and these countries had applied very little emphasis on improving the practices of CF. The little existing work on CF had focused to determine the level of optimum and suboptimum CF practices while no attention has been given to study the factors related to delay in introducing CF. The results of our study will aid health educators and policy-makers to device better IYCF strategies by incorporating factors identified through this study. The aim of this study was to determine the prevalence of and factors related to optimal CF practices among mothers of children aged 6–24 months in Hyderabad, Pakistan. A mixed-method study design was used. Data were collected from mothers of children aged 6–24 months during April to June 2012. One union council (a smaller administrative unit in a Taluka) was selected from Hyderabad where 40% of the population lived in rural areas. The study population included mothers having at least one child aged 6 to 24 months residing in Tando Qaiser Union Council of rural Taluka. This study site was a rural area covered by lady health workers, and it was conveniently reachable to researchers. Mothers of children with illnesses such as tuberculosis and severe undernutrition were excluded from the study. We estimated sample size using the formula for simple random sampling, given below. Assumptions included 52% prevalence of CF practices, 5% level of level of confidence, and 10% margin of error. We added 10% to the estimated sample to adjust for the nonresponse rate, and the final sample size obtained was 106. We used a multistage sampling technique to select participants. In the first stage, the union council was selected conveniently; in the second stage, four to five subclusters served by lady health worker were identified; in the third stage, one area was selected randomly through lottery method. Finally, 106 households were selected through systemic sampling method. Female data collectors were hired to collect quantitative data using a predevised questionnaire. The questionnaire was initially developed in English and then translated into local language, Sindhi. The questionnaire was pretested on 10% of the samples (n = 11) who were not part of the final sample. It contained sociodemographic and nutrition knowledge and practice. Field guide was developed to conduct in-depth interviews (IDIs) with mothers. A total of five IDIs were conducted. The participants did not allow tape recording; therefore, notes and responses were handwritten by a notetaker. IDIs were continued till the thematic saturation was achieved. IDI questions included: What is your opinion about breastfeeding? What do you understand about CF? How are the decisions made in your family as to what the newborn should be feed with? Prelacteal feed meant any substitute for breast milk; ever breastfed meant infants who were ever breastfed; current breastfed meant children aged <24 months of age who were breastfed at the time of study; exclusive breastfeeding meant infants <6 months of age who were breastfed exclusively; and optimal CF was defined as introduction of semisolid/solid food to child at the age of 6 months. The study was approved by the Internal Review Board of Health Services Academy, Islamabad (approval code: 12-4-16). We obtained written and informed consent from the participants before the interviews. The data were kept secured to ensure confidentiality. Data were analyzed through the Statistical Package for the Social Sciences version 19. Frequencies and percentages were calculated, and univariate logistic regression analysis was run with the dependent dichotomous variable of optimal versus suboptimal CF practices. We used Chi-square test to measure the statistical significance of factors associated with timely introduction of CF at 95% confidence level. The qualitative data analysis was performed manually using the testimonies and merged the data under common themes. Initially, the data were translated into English and cross-checked by the researchers. The data were triangulated along with the qualitative results so as to merge conclusions from similar results. Among 106 initially approached, six refused to participate and data were analyzed from 100 mothers. Mean age of participated mothers was 27.98 ± 5.425 years and only 41% of those women ever attended formal school. Mean age of the children was 15.62 ± 5.183 months and 54% of those were females. About 53% of the fathers had no formal education and 17% studied up to the primary level. More than half (55%) of the participants lived in extended families, 37% lived in mud brick houses, and 35% of households had no toilet facility. The average family size was 8.14 ± 3.31. Only 33% of the mothers knew about all five situations when hands must be washed, i.e., before cooking, feeding children or eating meal, and after toilet use and cleaning child's bottom, and only 37% of the mothers washed their hands in all of those five situations. About 44% of the families' monthly income was between 1000 and 2000 PKR (US$ 10-20) per person. About 91% and 10% of mothers, respectively, watched TV or listened to radio once a week. We found that 52% of the children were not being fed with semisolid food at or after the age of 6 months and 64% were being breastfed by their mothers. From the qualitative testimonies, we found that 41.7% of mothers started introducing CF at optimal age as they believed that the child was old enough, whereas 53.8% of mothers fed their babies were breast milk because they thought babies are crying for milk only. About 63.5% and 70.8% of mothers in optimal CF and suboptimal CF groups, respectively, decided about their children's feeding themselves [Table 1]. We performed a univariate regression analysis using “feeding practices” as the dependent variable. We found that mothers who practiced optimal CF were 2.91 times more likely to have ever attended a school, 2.78 times more likely to have resided in a cemented house, twice as likely to have watched TV at least once a week, 1.09 times listened to radio at least weekly, twice likely lived in a nuclear family, compared to mothers who had delayed CF. 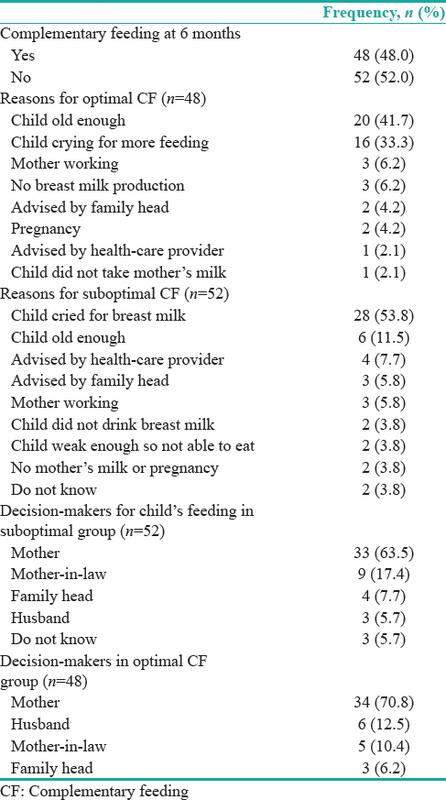 However, the associations for listening to radio, type of family, and mothers still breastfeeding were not statistically significant (P ≥ 0.05) [Table 2]. Although most of the mothers in IDIs reported breastfeeding their children, they reported not breastfeeding their children on confirmation of their pregnancy. Women also discontinued breastfeeding because they thought that they could not produce enough milk to feed the child. Some mothers reported it as their choice. A mother said: “I only breastfed my first child”. Our study found that more than half of women did not comply with optimal CF practices for children at six months of age. This study also found that lack of education of mothers and living in mud houses (an indicator of poverty) was related to suboptimal CF practices while watching television was related with better practices. Our results are consistent with similar research from Pakistan and other LMICs. The recent National Nutrition Survey of Pakistan showed that the rate of timely introduction of semisolid food to children in rural areas of the country was 45%. However, timely initiation of CF practices shown by our study is lower than in the regional countries compared to 71%, 70%, and 55% of children in Bangladesh, Nepal, and India, respectively. However, Sri Lanka has the highest CF rate in South Asia, i.e., 84%. Educated mothers in our study were 2.91 times more likely to feed their children optimally. Earlier studies have reported that maternal education is significantly associated with suboptimal CF practices. Our qualitative findings also support and explain that most of the mothers were not aware about the specific age of the children when it was important to start CF. They gave various reasons for not introducing CF on time. Some believed that semisolid and solid foods were hard on their children, and they avoided these foods because they were worried that the children could suffer from vomiting or diarrhea. Despite that the mother is the primary caretaker of the child, most of the decisions including what to feed is made by her husband and mother-in-law. Mother also acknowledged that their mothers-in-law have more knowledge about the importance of CF children on nutrition-rich foods. Type of house was significantly associated with CF practices in our study, which is considered as an indicator of socioeconomic status. The likelihood of starting CF in at optimum age of children was 2.78 times higher among mothers who lived in cemented houses. Poverty has been shown to be significantly associated with delayed introduction of complementary foods elsewhere., A previous study also reported that introduction of CF on time is shown to be higher in richer households. In the testimonies, mothers reported giving children tea, biscuits, and dairy products as part of CF because nutritious CF food was expensive to afford. Therefore, food security and knowledge about the essential foods for children and their local availability are critical to the children receiving their CF on time. Lack of knowledge has been associated with mothers failing to initiate CF on time. Watching television, at least once a week, was associated with timely initiation of CF, and this finding is consistent with other studies that show that media exposure, especially watching television, is related to better CF practices. The Lancet nutrition series recommended that CF practices could be improved, to prevent undernutrition and related morbidity in children under 5 years of age, through highly effective interventions such as counseling mothers and families about nutrition and locally available and cultivated essential foods, provision of food supplements, and subsidies for food insecure segments of the population. As the households were not numbered, we had to select the participants through a systematic sampling method, which was a limitation of our study. Other limitations included the reliance on mother's recall to ascertain the feeding practices and lack of permission to record the qualitative interviews. The prevalence of delayed introduction of CF in children aged 6-24 months is still high in rural areas of Pakistan. Lack of education, lower socioeconomic status, and lack of media exposure are the factors associated with timely initiation of CF. The results of the study can be applicable in other similar settings. Further research is required to measure CF initiation behavior among mothers and its association with long-term outcomes such as under-five child mortality and morbidity. The authors would like to thank the mothers who participated in this study. Badham J. Ensuring optimal breastfeeding and improvements in complementary feeding to improve infant and young child nutrition in developing countries. Matern Child Nutr 2013;9 Suppl 1:1-5. Victora CG, Adair L, Fall C, Hallal PC, Martorell R, Richter L, et al. Maternal and child undernutrition: Consequences for adult health and human capital. Lancet 2008;371:340-57. Mamemoto K, Kubota M, Nagai A, Takahashi Y, Kamamoto T, Minowa H, et al. Factors associated with exclusive breastfeeding in low birth weight infants at NICU discharge and the start of complementary feeding. Asia Pac J Clin Nutr 2013;22:270-5. White H. Tackling childhood undernutrition. Lancet 2008;371:539-41. World Health Organization. Under Five Mortality-Situation; 2015. Available from: http://www.who.int/gho/child_health/mortality/mortality_under_five/en/. [Last accessed on 2015 Dec 30]. UNICEF. Improving Child Nutrition; the Achieveable Imperative for Global Progress. New York, USA: UNICEF; 2013. National Institute of Population Studies. Demographic and Health Survey; 2012-2013. Ruel MT, Menon P, Habicht JP, Loechl C, Bergeron G, Pelto G, et al. Age-based preventive targeting of food assistance and behaviour change and communication for reduction of childhood undernutrition in Haiti: A cluster randomised trial. Lancet 2008;371:588-95. Qasem W, Fenton T, Friel J. Age of introduction of first complementary feeding for infants: A systematic review. BMC Pediatr 2015;15:107. Agarwal RK. Importance of optimal infant and young child feeding (IYCF) in achieving millennium development goals. Indian Pediatr 2008;45:719-21. Lassi ZS, Das JK, Zahid G, Imdad A, Bhutta ZA. Impact of education and provision of complementary feeding on growth and morbidity in children less than 2 years of age in developing countries: A systematic review. BMC Public Health 2013;13 Suppl 3:S13. Lakati AS, Makokha OA, Binns CW, Kombe Y. The effect of pre-lacteal feeding on full breastfeeding in Nairobi, Kenya. East Afr J Public Health 2010;7:258-62. World Health Organization. Indicators for Assessing Infant and Young Child Feeding Practices. Geneva: World Health Organization; 2009. Aga Khan University Pakistan, Pakistan Medical Research Council (PMRC), Nutrition Wing Government of Pakistan, UNICEF. National Nutrition Survey Pakistan; 2011. Kabir I, Khanam M, Agho KE, Mihrshahi S, Dibley MJ, Roy SK, et al. Determinants of inappropriate complementary feeding practices in infant and young children in Bangladesh: Secondary data analysis of Demographic Health Survey 2007. Matern Child Nutr 2012;8 Suppl 1:11-27. Joshi N, Agho KE, Dibley MJ, Senarath U, Tiwari K. Determinants of inappropriate complementary feeding practices in young children in Nepal: Secondary data analysis of Demographic and Health Survey 2006. Matern Child Nutr 2012;8 Suppl 1:45-59. Patel A, Pusdekar Y, Badhoniya N, Borkar J, Agho KE, Dibley MJ, et al. Determinants of inappropriate complementary feeding practices in young children in India: Secondary analysis of National Family Health Survey 2005-2006. Matern Child Nutr 2012;8 Suppl 1:28-44. Senarath U, Godakandage SS, Jayawickrama H, Siriwardena I, Dibley MJ. Determinants of inappropriate complementary feeding practices in young children in Sri Lanka: Secondary data analysis of Demographic and Health Survey 2006-2007. Matern Child Nutr 2012;8 Suppl 1:60-77. Shumey A, Demissie M, Berhane Y. Timely initiation of complementary feeding and associated factors among children aged 6 to 12 months in Northern Ethiopia: An institution-based cross-sectional study. BMC Public Health 2013;13:1050. Victor R, Baines SK, Agho KE, Dibley MJ. Factors associated with inappropriate complementary feeding practices among children aged 6-23 months in Tanzania. Matern Child Nutr 2014;10:545-61. Semahegn A, Tesfaye G, Bogale A. Complementary feeding practice of mothers and associated factors in Hiwot Fana specialized Hospital, Eastern Ethiopia. Pan Afr Med J 2014;18:143.